lol...I shot most of my energy before I even got in the room. And my pc couldn't hardly run it. I need a new laptop. Good idea though with a fps. I'd play again with some polish. Nice work! Nice idea and style, I couldn't get past the both rooms x) Not enough energy/time to shoot all of them and drain the orbs, and there were some inconsistency of how much energy the doors drained. If you go with the idea of interval spawning and timed orbs, maybe give the player a low energy gain so the player has a chance to fend of the enemies even if he uses his energy badly. Cool idea! Lots of nice visuals for a weekend jam. 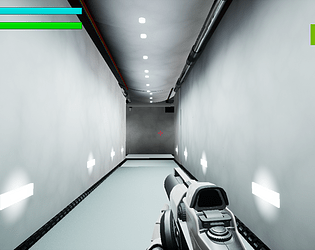 The level design is pretty cool but it seems like the lighting is a little off. Seems to have lots of potential though, would be nice to see what you continue with!